Is there a better alternative to SideTrack? Is SideTrack really the best app in Other category? Will SideTrack work good on macOS 10.13.4? 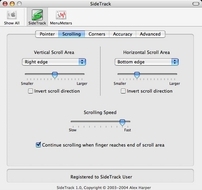 SideTrack is a replacement driver for the Apple MacBook, PowerBook and iBook trackpads. 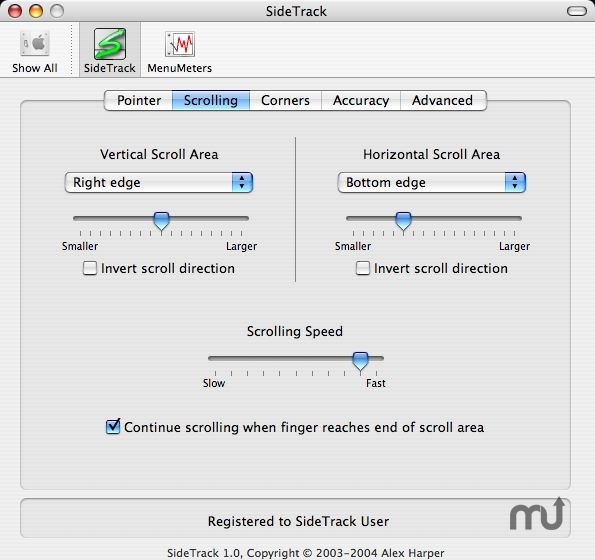 With SideTrack installed your standard trackpad becomes a powerful multi-button scrolling mouse. [FEATURE] Compatible with the public release of Mac OS X 10.5 (Leopard). [FEATURE] Support November 2007 MacBook models. [BUG] Workaround Leopard built-in keyboard driver dependency by supplying a wrapper keyboard driver with SideTrack. [BUG] Change trackpad tap click timing logic to accommodate Leopard applications with slow event loops (Finder, possibly others). Mac OS X 10.2 or later, supported MacBook, MacBook Pro, PowerBook or iBook model. SideTrack needs a rating. Be the first to rate this app and get the discussion started!